Look! Up in the sky! Its a bird! It’s a plane! It’s the man of steel! Now this is what I’m talking about. Man Of Steel is in a special place as a reboot, a carefully calculated yet ambitious and affectionate movie giving a new energy and enthusiasm to a cherished American icon. The last thing I wanted Man Of Steel to become was a remake of the original Superman movies, or even worse, a PG-13 version of Watchmen. We have none of that here. It isn’t coy, formulaic, or insincere: it’s a rare rebooted superhero remake that affectionately, genuinely works. In case you haven’t picked up on it by now, Man Of Steel is a retelling of the story of Superman. Clark Kent (Henry Cavill) is a young inhabitant of Smallville, Kansas who deals with a specific problem that other teengers his age doesn’t deal with: he has metahuman powers the likes of which cannot be from planet earth. And young Clark isn’t from planet Earth either: but he doesn’t know that. Not yet. You see, Clark’s real name is Kal-El, and he comes from the planet Krypton, a planet that died due to its own selfishness and greed. Scientist Jor-el (Russel Crowe), who is the father of Kal-El, knew of Krypton’s future demise, and planned ahead for it. He embedded the code of Krypton’s DNA within his newborn son, Kal-El, and sent him to a faraway planet where he not be harmed from Krypton’s destruction: Planet Earth. Unfortunately, his former ally and friend General Zod (Michael Shannon) is hellbent on preserving his species and building a new Krypton on planet Earth. For this he needs Clark and his DNA to fuel his machine so that they can form a rebirthed Krypton upon the ashes of Earth’s surface. Clark, fully knowing where he came from and the extent of his abilities, decides to defend the earth from Zod’s evil scheme and to become the symbol of hope for all of mankind to follow. Fully aware of the dangers that came with a reboot for Superman, one of my initial worries for the film was that there would be too much action and not enough character investment to go with it. That is the typical danger with superhero movies, after all: filmmakers are typically more interested in the action and visual effects than they are in emotion or in investment for their characters. That is not what we have here. Director Zack Snyder (300, Watchmen) and screenwriter David S. Goyer (Dark City, The Dark Knight Trilogy) make here a wonderful marriage of something rare: great scripting with great action, and great directing. What makes this movie so appealing is not the fact that it is an action movie: we’ve seen hundreds of movies before where action is just stacked on top of action, with no real cause or motivation to be concerned with any of it. Man Of Steel is not that. It is a rare thing: a movie in which the action is just as fleshed out as the character’s emotions are. Whenever Clark isn’t flying, breaking the sound barrier, or punching some guy’s light’s out, the movie interjects a flashback of Clark’s childhood: we get a glimpse to a more personal portrait of Clark as a child and what it was like growing up struggling with these superhuman powers. Perhaps in another movie it would be all fun and jokey, but here it is taken as seriously as the death of Bruce’s parents from the Batman series. I was reminded of the last line Peter spoke during his ending monologue of the original Spider-man: “This power is my gift: my curse”. The action, however, is utterly spectacular. In the original Superman movies, Clark was resorted to lifting up school buses and stopping nuclear missiles as his highest challenges. Not here. Here the stakes are much higher, and we can tell that because of the level of destruction in this movie. When Superman trades blows with another Kryptonian, destruction is sure to follow. Crushed cars and overturned trains are a constant during these fight scenes. Crumbling buildings and falling debris is to be expected. There was even one terrifying moment where the Kryptonians used a gravity machine to tear apart the Earth’s infrastructure. Did I mention the crumbling buildings? Watching this level of destruction made me feel sorry for the mayor of Metropolis. I’d hate to see the repair bill. And lastly, I must pay respect to Henry Cavill and Michael Shannon. Here, they are the perfect embodiment of themselves: good, or evil, human or Kryptonian. 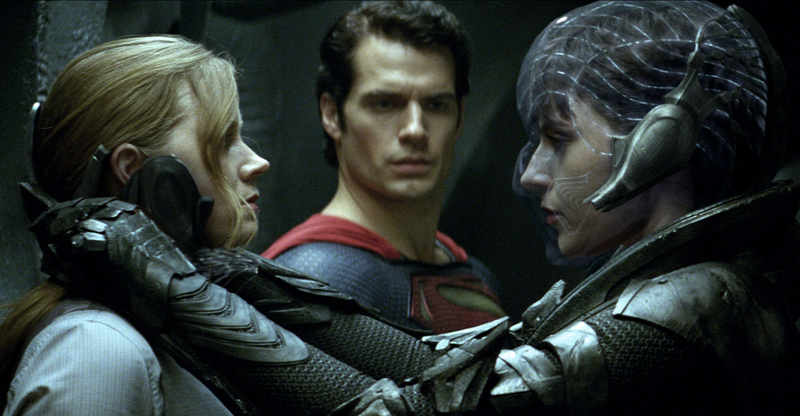 They don’t fight in an area of black-and-white: they fight in many shades of gray, because while we don’t want Clark to lose his home on planet Earth, we also understand and sympathize with Zod’s reasonings because he too lost his home. There’s a very human reason why these men are fighting, and there’s no simplicity in their conflict: only complexion and brutal reality. Before you ask me, no this does not replace the original “Superman” movies, and no, Cavill is not an adequate replacement for Christopher Reeve himself. That is besides the point. Man Of Steel did to the Superman franchise what The Amazing Spider-man did for Spider-man: it breathed a new life and conception to it, ensuring that when its all said and done, the Superman legacy will live on, and it will not die away because the actor of the former icon has passed through time. Snyder has accomplished quite a feat here: he has paid tribute and honor to Reeve and the filmmakers of the original Superman by offering this exciting, emotional, and action-packed thrill ride that gives a new birth to the flying caped crusader. PS: Admittedly, I saw this film in IMAX 3-D. See it in IMAX, but don’t waste your money on the 3-D. A fantastic movie doesn’t deserve a dim picture anyway.